**Important! ** Evidence intake procedures have moved to a new page. Please visit here for more information. 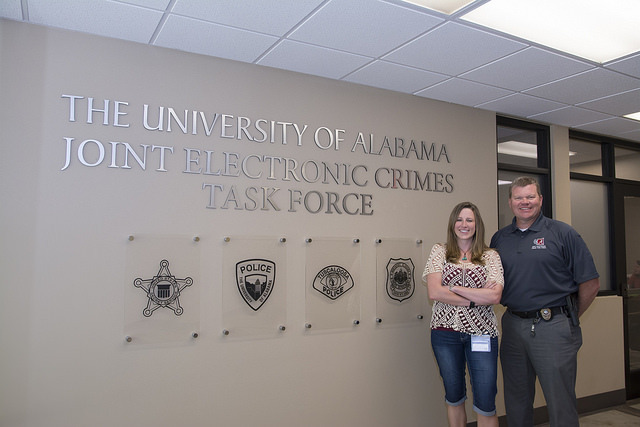 The Joint Electronic Crimes Task Force (JECTF) at the University of Alabama, established in August 2014, is a project initially funded by a grant from the Alabama Department of Economic and Community Affairs (ADECA). Dr. Diana Dolliver serves as the Academic Director for the lab and UAPD Capt. Clay Hickman serves as the Law Enforcement Director. Created through a partnership between the Department of Criminology and Criminal Justice, the College of Arts and Sciences, and local law enforcement agencies, the lab assists local and national law enforcement officials with processing digital evidence for use in cybercrime prosecutions. The JECTF is currently a member of Alabama’s Internet Crimes Against Children (ICAC) Task Force. If you are a graduate or undergraduate student at U.A. and are interested in internship opportunities at the JECTF/NIL for fall, spring, or summer semesters, please visit the internship page for further details. If any law enforcement agencies are interested in the JECTF hosting trainings for their organization, please visit here. The JECTF Lab is located in the Cyber Hall building on UA’s Campus, 100 3rd Place Tuscaloosa, Alabama 35487. For all law enforcement and academic enquiries, please email JECTF@ua.edu or call (205) 347-0608. **Note: do not enter the address into Google Maps; it may not direct you to our location due to the recent construction and road changes in the area. Please use the UA Campus Map to find us.